It was a hands-on approach that led Stefan (Steve) and Joan Anderson to their lasting relationship with Ball State University. The retired chairman and CEO of Muncie's First Merchants Corporation, Steve served as chair of Wings for the Future, Ball State's first capital campaign. It was during that campaign that he and Joan established the Dr. T.M. Anderson Scholarship program. Named after Steve's father, this scholarship is awarded to Honors College students studying history. The Andersons utilized appreciated stock for the initial and subsequent gifts to the Anderson fund. In fact, the scholarship was initially funded with highly appreciated stock purchased by Dr. T.M. Anderson himself more than 50 years ago. After an early career with IBM and knowing she was in line to become president of the local Girl Scout Council, Joan decided to pursue a master's degree in management at Ball State, which she completed in 1990. Steve was an organizer and initial chair of the Miller College of Business Executive Advisory Board. It was the couple's involvement with an immersive learning class at the Virginia Ball Center for Creative Inquiry that truly cemented their commitment to Ball State. "We were able to travel with the students to London and got to know each of them very well," says Joan. "The program encouraged us even more to financially support the bright students at Ball State." 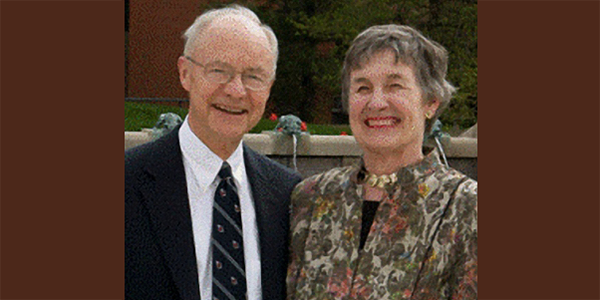 When deciding upon the method of supporting Ball State further, the Andersons chose an option with great benefits. "We have used appreciated stock instead of cash to support every major campaign of the university, and I like to think we have benefited as much as Ball State," says Steve. "It was easy; it helped us diversify our assets, and it meant lower taxes in the long run. We think it's a smart way to give to a wonderful university!"